I've just bought a Squier Jaguar VM. Arthritis is taking a toll on my fretting hand so I wanted a short scale that I could customise as my 'working' guitar i.e. fairly versatile guitar. I already have a CIJ Jaguar a 65 RT Mustang and a Jagmaster so I know 24 ins scale makes things a lot easier for me. I keep these guitars for specific roles - e.g, Jaguar for surf and so on. In general I'm quite happy with the guitar - there are some flaws but as I will be changing the relevant components I don't care about them. The quality of the body and neck is excellent and I think that when I make he changes I want I should have a first class instrument for a fraction of the price of a current Fender branded model. Change trem arm to StayTrem. The stock is a real pain and flops all over the place - none of the usual tricks seem to last long - anyway the parts are on their way to me. Rewire to 'All Off' serial mod - happy to keep the strangle feature. Maybe change the bridge to a Staytrem - but so far I've had no problems with the stock bridge (can't afford a Mastery). So I'll see how that goes. I quite like the neck pickup - it sounds quite sweet but the bridge is really too thin for what I want - remember I want this as a more general purpose axe (for that read blues and 60-70's pop - yes I know I'm old)! Trawling the net I see Creamery pickups in the UK (I'm UK based ) do a range for the Jag. Their 'Wide Range' or special P90 looks interesting. Has anyone any experience with these? Apropo the above I'm thnking of changing the pots to 500meg - any recommendations on a suitable cap value to thicken things up a bit when the tone is rolled off? I haven't had the pickguard off but it seems almost impossible to adjust the pickup height so I guess they have the crappy plastic tubes around the screws - so whatever I fit I'll change these to springs. Any experiences on the above - paticularly the pickups would be useful. Sorry to hear about your arthritis, I think I am headed towards pretty bad RA myself. No experience with the Creamery pickups. 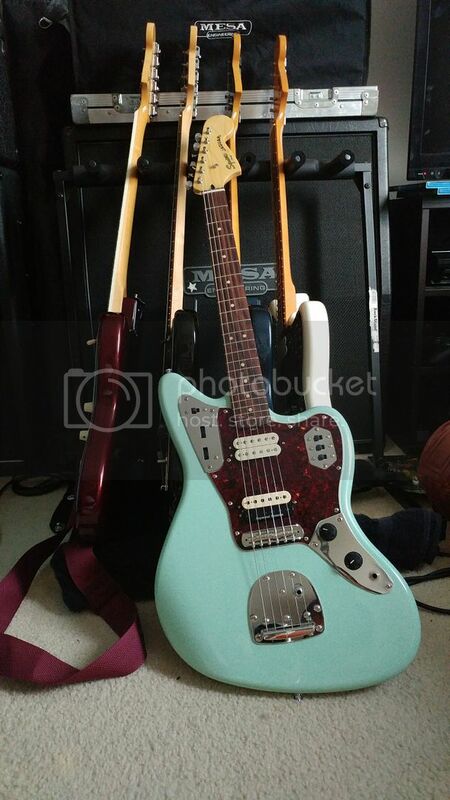 I put a JB Jr in my CIJ Jag back in the '90s after not liking the bridge pickup; it still has plenty of traditional character mainly due to the remaining stock neck unit and the 1meg pots that everything runs through on the lead circuit. You may want to look into the Seymour Duncan Quarter Pounder and SJAG pickups. Those have pretty much been the single coil replacement of choice for the Japanese Jags for 20 years or so, though admittedly it's a much more "considered" guitar these days and there are tons of other options by now as you've noticed. Since you're thinking of swapping to 500k pots I'd give that a try before changing the pickups. While the relationship between the pickups is unlikely to change, you might enjoy the sound of the bridge unit a little darker. I thought I was going to change the pots AND pickups in my Jag-Stang but after swapping the pots I decided it sounded just fine, and it's among cheapest mods you can make. For pot value on a 500k pot I'd go with .022uf every time. 500k pots with a .022uf cap are my fave guitar tone control scheme to actually use while playing, ideally with a P90 or Tele bridge pickup running into a dirty valve amp. Most likely the traditional Jaguar/Jazz Bass scheme with foam under the pickup. I've never actually had a problem with the tubing for height adjustment, not that I'd ever particularly crave it, but I think the foam scheme is worse. Thanks for the reply. I'll have a look at the pickups you mentioned - see if I can audition them. I'll go with your recommendation for the cap. Anyway their cheap and easy to change out until I find the one I like best. The Staytrem arrived today - easy to fit and looks like it will be a great improvement - time will tell! I think what your hinting at is try one mod at a time - so I'll go with changing the pots and cap first - try it and see if I want to do any more changes. I forgot they used foam to seat the pickups on the Jag - probably the cause of the problem. Sometime I'll remove the pickguard and see what's underneath. Hope your RA doesn't gallop along as mine has the last couple of years. used to play keyboard as well but gave that up because of arthritis in my wrists. If all else fails there's still the harmonica. I got one for modding, too. The bridge has to go; the saddle width is wrong and they're not tall enough. I replaced mine with a Mustang bridge, just shimmed the outside saddles to account for the 9.5" radius. Pickups do indeed have a foam backing with no tubes or springs around the screws. That's the traditional style for body-mount pickups. If there's no adjustment range, you might try putting more foam underneath, i.e. stack more foam on top of the existing foam. Also, if you don't like the bridge pickup, try swapping the bridge and neck. Sounds odd I know, but it's worth a go. I'll always recommend American Vintage pickups as well, they're not terribly expensive (at least in the US) but they sound fantastic. One other thing worth noting, these are routed the same as AV models. Without routing, they only fit Jaguar pickups, and only take AV pickguards. CIJ / MIJ won't fit. I bought a CP Jaguar HH guard, and it was plug and play after routing for HB's. YMMV with a CP single coil guard. Based on the above I'm assuming the pickup mountings will match... Either way all the screw holes lined up right on the money for me. Thanks for all the suggestions. I've fitted the Staytrem arm and it makes a helluva difference. With the arthritis my finger vibrato has gone to the dogs so I use the Trem arm to get a vibrato effect. Like it so much I'll fit one in my CIJ Jag and take a look at one for my Mustang. I think I'll change the bridge for the Staytrem version which seems to tick all the boxes and is reasonable affordable. Next mod is to change the pots and cap and see what that does. Then probably the series mod. If that gets me where I want to be I'll leave the pickups - if not maybe try the suggestion to swap the bridge and neck or try to audition the pickups that have been suggested. Things will happen as time and mainly funds allow over the winter. BTW it played very well out of the box and so far has had very little need for adjustments. dream 90 or mean 90.